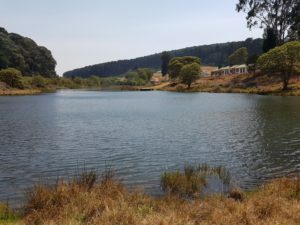 We decided to change up our schedule slightly so we could use some of our planned rest days on the lake to go through to Nyika National Park instead. 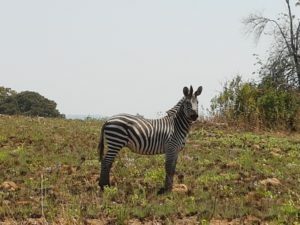 It was recommended to us as a place to visit whilst in Malawi especially as it is known for its leopards. So from the town of Mzuzu we cycled a flat and easy 72km through to a town called Rhumpi where we stayed at a campsite called Adios. The next morning, we got up at first light to pack up camp so we could get on the road as soon as possible to head over to the National Park. We managed to arrange with the kind staff at Adios to look after our Buffalo bicycles and a few boxes as we needed to make some space for us six to fit into the Jeep and Ford with all our bags. 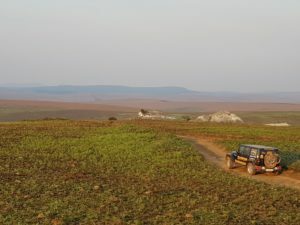 We were under the impression that the 105km to Nyika National Park would take us around an hour and half but no-one had mentioned to us that the road through to the Park is a long dirt road with a lot of rocky ascents and descents. You definitely need a 4×4 and having a trailer meant we had to drive really slow. 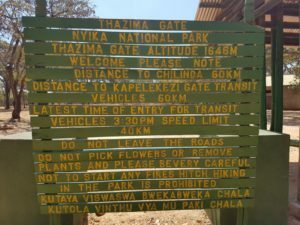 After three hours we finally got to the Nyika National Park Gate, which was about 55km from Rhumpi but still had a further 60km to get to Chelinda Campsite. As we were paying the entrance fees, Warrick noticed that the Jeep’s back left tyre had a small puncture. As the puncture was quite small we thought we would be able to use one of those tyre fillers to seal it. We drove the recommended 12km and it seemed as though the puncture had sealed so we got out the compressor and pumped it up to the recommended pressure. About an hour later we started to notice that the puncture had not sealed properly and so we had to stop again to pump the tyre up. As we were now in the Park we were all very keen to hopefully see some wildlife on our way to the campsite. Unfortunately, we didn’t see very much wildlife except a few klipspringers, mountain reedbuck and some zebras but we were all in awe of the incredible views as we climbed up to close to 2400m in altitude. We finally got to Chelinda Lodge after over six hours and all felt a bit exhausted as to how long the drive had taken us. 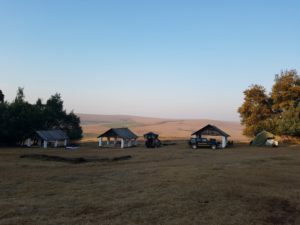 After booking in we drove up to the campsite which is situated next to a pine forest and has the most beautiful view of the rolling grassland hills where roan antelope and mountain reedbuck grazed. We had all expected Nyika National Park to be a typical game reserve with lots of general wildlife but instead it was more like Dullstroom in South Africa with three huge dams available for trout fishing as well as pine forests and open grassland hills that just go on forever. The next day Warrick went down to reception where the mechanic met him to help plug the puncture in the Jeep’s tyre. We then got some advice from the Chelinda lodge game ranger as to where we could go on a game drive. He suggested a route for us to take which was a loop to Chelinda Bridge. On the drive we saw a lot of different antelope including a massive herd of eland and roan antelope as well as a rare sighting of a pair of Denham’s Bustards. The views were really incredible and we literally felt like we were in the middle of nowhere as we did not see a single car or person along the way. The loop took us back to Chelinda Lodge where we decided to do some trout fishing for a few hours. Sadly, we did not catch anything although we had high hopes of having a wonderful trout dinner. We then decided to go through to Chosi Viewpoint for sun-downers and hoped to maybe see the resident leopard that lives in the area but unfortunately it did not show its spots. Being so high up in the mountains it was no surprise that by sunset the temperature plummeted and we all enjoyed an evening huddled around the fire. The next morning, Warrick, Bryan and Cam decided to go for an early morning run to the nearby airstrip. It was really fresh that morning with a bit of mist around which was really beautiful. We then packed up camp and headed back on the long dirt road back to Adios campsite in Rhumpi for the night. That night we had gale force winds going through the valley and all us did not sleep very well. We all expected our tents to just break and blow away in the wind it was so strong but we were all very grateful to wake up to find nothing was damaged. As everyone barely slept we all got up at sunrise and were on our bicycles by 7am on our way to a place called Chitimba Camp on Lake Malawi. With the wind pumping the first few kilometres were really tough going and we all felt like we were almost cycling backwards. At 5km into our ride Gareth got a puncture in his front tyre which he managed to patch up fairly quickly. Then at 11km Warrick managed to break a spoke on his back tyre and so we ended up having to replace his back tyre. Thankfully we did not have any more mechanical issues for the rest of the 85km ride back to the Lake. The cycle was pretty spectacular as you ride along a river for most of the journey and then after a really steep tough climb you descend down this windy mountain pass with the most amazing views of the Lake. 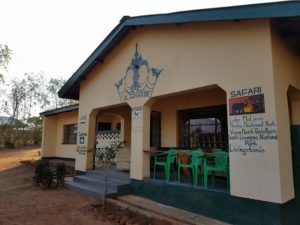 We are now staying at Chitimba Camp and will be here for one rest day before heading further up the lake to one last stop and then we will be making our way to our next country, Tanzania. 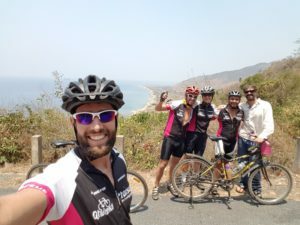 Copyright © 2019 Joburg2Kili. All rights reserved.